One of the most popular types of engagement ring settings are diamond accented engagement rings. A diamond accented engagement ring features a center stone as well as diamond accents on the band. Eternity style engagement rings have become popular choices due to the rings featuring diamonds the entire way around the band. I wanted to highlight three of our eternity engagement rings that are unique and distinctive despite their similar styles. These rings are available in different metal types and finger sizes. To learn more about each ring, you may click on the link or image below. This is a more traditional eternity engagement ring because it features round brilliant cut diamonds on the band. 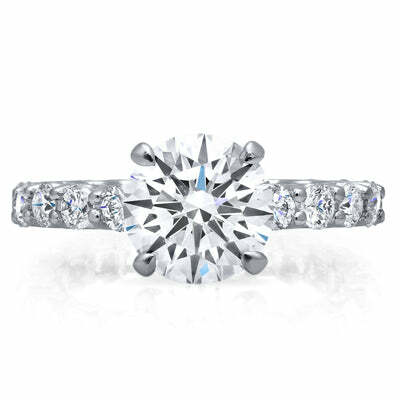 The ring has a u-prong setting and the diamonds that we select will have G color with VS clarity. The ring setting will have an approximate total carat weight of 1.15 cttw. This ring setting is ideal for any shape center stone ranging from 0.50 ct to 5.00 ct. 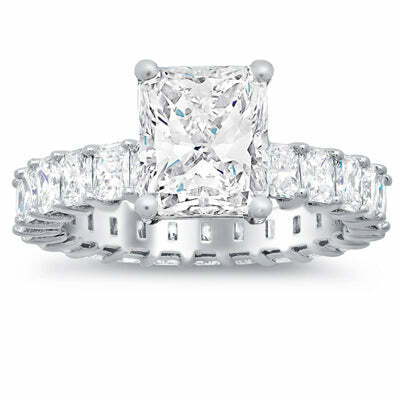 If you love the look of a radiant cut diamond eternity band, this engagement ring setting is an impeccable option. 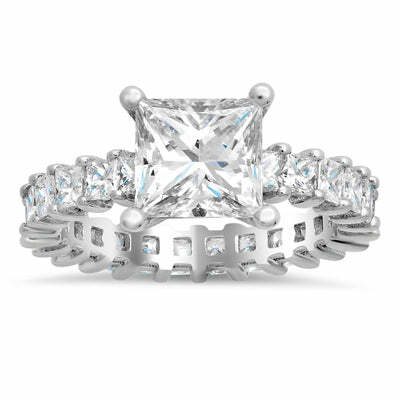 The band has a shared prong setting and will be set with approximately 1.75 cttw of radiant cut diamonds. We will choose only G color VS clarity diamonds by hand. This ring may be set with any shape diamond that weighs between 0.50 carats and 5.00 carats. Radiant cut diamonds can have a rectangular shape, giving the ring an extraordinary look. If you prefer square cut diamonds, this princess diamond eternity engagement ring is a lovely choice. The ring features approximately 1.80 cttw of G color VS clarity diamonds. We designed our engagement ring with a shared prong setting, which will showcase the sparkle and brilliance of the diamonds beautifully. This ring may be set with diamond of any shape and carat weight between 0.50 ct and 5.00 ct.